Mr Ranjit Singh, son of former Deputy Prime Minister Devi Lal and estranged brother of Haryana Chief Minister Om Prakash Chautala, joined the BJP here today. Ranjeet Singh Chautala with BJP President Venkaiah Naidu and Arun Jaitley at BJP headquarters in the Capital on Monday. Haryana Chief Minister, Om Prakash Chautala said here today that Prime Minister Atal Bihari Vajpayee had failed to come up to his expectations. The political atmosphere in Haryana is all set to be charged up as the ruling INLD holds a crucial rally to mark the four years of its government at the Nehru College ground here tomorrow. Haryana Chief Minister, Om Prakash Chautala’s announcement yesterday about giving the INLD ticket for the Sonepat Lok Sabha constituency to Ms Krishna Malik, wife of Haryana Director-General of Police, Mr M.S. Malik, has drawn sharp reaction from Opposition parties. A new political outfit, the Samajwadi Labour Party, was formed by Mr Rajender Singh Tanwar, president of the Pichhra Warg Jagriti Manch, here yesterday. The District Magistrate, Mr R.S. Doon, in an order under Section 144 of the Code of Criminal Procedure has prohibited the gathering of five or more persons and carrying of weapons including firearms, lathis, swords, barchhas, knives and gandasas, in Karnal on March 2 keeping in view the call to block the rail traffic at the local railway station by the Congress. The Haryana College Teachers Union at a meeting of its office-bearers held here yesterday deplored the decision of the state government to withdraw grant-in-aid to the B.Ed. colleges in the state. The Chief Judicial Magistrate, Ambala, has granted bail to Youth Congress activists, who were arrested by the police while they were waving black flags and raising slogans against the BJP general secretary, Mr Parmod Mahajan, near the Air Force station on Sunday. Mr Mahajan was going to address a rally at Ambala City, along with the Union State Minister for Home Affairs, Mr I.D. Swami. A murder convict in Karnal jail was murdered by one of his brothers lodged in the same jail, early this morning. Illicit relation with his brother’s wife’ was allegedly the reason behind the murder. A magisterial inquest has been ordered into the incident by the District Magistrate. The potential of dairying in Punjab was yet to be fully tapped on scientific lines to enhance the milk production in the state and to improve the condition of the landless and small marginal farmers who were passing through hard times. A scintillating musical evening for defence officials was held in Ambala Cantonment in association with The Tribune. The evening was organised at the Sirhind Club under the aegis of Headquarter Punjab Haryana & Himachal Pradesh (Independent) Sub Area. AMBALA: ‘Langdi Hindi’, a special language which was used for book-keeping in the olden days, is on the verge of extinction. The language was not only commonly used here till recent times, there was a school here which was dedicated to teaching `Langdi Hindi’ to the aspiring `munims’. Now, the ledger books are either maintained in Hindi or English. The Air Fmn Postal Unit of the Army Postal Corps celebrated the 32nd anniversary of the corps at the unit headquarters, Ambala Cantonment. About Rs 500 crore have been spent during the past four years on augmenting electricity supply in the state. The Haryana Governor, Babu Parmanand, and his wife, Mrs Sudesh Kumari, visited the ancient Civil Rest House at Pehowa, 25 km from here, today. An agent of an insurance company was murdered with a sharp-edged weapon in Sector 8 here late last night. A married woman (30), was crushed under a train here, this evening. Mr Ranjit Singh, who had revolted against Mr Om Prakash Chautala after the Meham violence, had joined the Congress after remaining in hibernation for sometime. He was in the Congress for nearly a decade and had held some important positions, including that of the vice-president of the Haryana Pradesh Congress Committee. He could not make any big impact in the state. The former Haryana minister and former MLA from the Rori Assembly constituency has decided to join the BJP at a time when the Indian National Lok Dal (INLD), headed by his elder brother Om Prakash Chautala, has severed its ties with the BJP. The admission of Mr Ranjit Singh in the party appears to be an effort by the BJP to take on Mr Chautala’s INLD and embarrass the Congress on the eve of the crucial Lok Sabha elections. BJP President M. Venkaiah Naidu, who formally welcomed Mr Ranjit Singh into the party, gave an indication that the party may not give him ticket for the coming Lok Sabha elections but would rather utilise him for campaigning in the state, especially in rural areas. “When he (Mr Ranjit Singh) approached me to express his desire to join the BJP, he told me that he wanted to work for the party as an ordinary worker,” Mr Naidu said, while addressing Mr Ranjit Singh’s supporters, who had gathered in the BJP Headquarters here. Mr Naidu said his joining the party ranks would help the party widen its social base in Haryana. Highlighting the steps initiated by the BJP for the welfare of the farmers, the BJP President said, “There can be no Ram rajya without gram rajya”. The BJP President also noted the influence and respect Mr Ranjit Singh had among the farmers in Haryana. 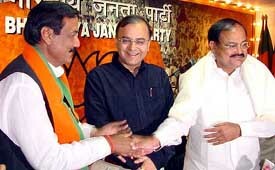 Earlier, three former envoys — Mr Girish Dubey, Mr G. S. Aiyar and Mr B. M. Ojha — also joined the BJP. Mr Ojha was the Indian Ambassador to Sweden between 1984 and 1987 He has written a book on the Bofors gun deal controversy. The others who have joined the party from Tamil Nadu are Mr Rama Suganthan, son of former Union Minister Vazapady Ramamurthy, and Mr P. P. Kaliya Perumal, former MP and state vice-president of the Tamil Nadu Congress Committee who had resigned from the post. The other entrants to the BJP are Mr Ponga Nagar Sekar, Mr Satish Kumar, Mr Panruti Murugesan, Kottivakkam Ravi, P. Maniarasan, J. Ramasamy, Tamil Rajiv Congress (TRC), Mr Mayilai Subramanian, Mr Ozhugur Ekamabarm, Mr Padavur Rajendran, Mr R. M. Muralitharan, Mr Ravi, Mr S. Rabakaran, Mr Saravanan, Mr Sivalingam, Prof M Latchumanan, former TRC state Secretary in Pondicherry, Mr Kalaiselve Saravanan, Mr Sengottai Jegan and Mr Malayalathan. Talking to newsmen at his official residence, Mr Chautala said though he continued to hold Mr Vajpayee as a person in high esteem, he was greatly pained when the Prime Minister opened his party’s election campaign from Ayodhya and sought another five years to build the Ram temple. Mr Chautala said: “It is not a statesman’s job to build temples, which should be left to religious leaders. A statesman is to build the nation.” The INLD supremo went on to say that if a person could not build the temple in five years, what was the guarantee that he would accomplish the task in another five years. Virtually ruling out an alliance with the BSP, Mr Chautala said though no possibility could be ruled out in politics, the INLD planned to contest all 10 Lok Sabha seats in Haryana on its own symbol. Asked if any rethinking was going on about his party’s ties with the BJP, Mr Chautala said let the state BJP leaders test their capabilities in the parliamentary elections. Mr Chautala, who had earlier announced that he would declare his party’s candidates at tomorrow’s Jhajjar rally, said he would name the nominees at an appropriate time. He said there was no need for the transfer of the Director-General of Police, Mr M.S. Malik, whose wife would contest the Sonepat seat on the ruling party ticket. He said going by this argument, he should also resign as the Chief Minister because his son would contest from Bhiwani. Coming down heavily on the BJP, Mr Chautala said though it was his alliance partner, its state leaders were in league with the Congress, which, despite being the main opposition party, did not oppose his government’s policies and programmes as much as the BJP did. Even now, he said, the BJP would not contest the elections in Haryana without an alliance with some other party. Highlighting the achievements of his government, he said the biggest achievement of his party was the political stability in the state. He was able to eradicate the menace of defection by denying the party ticket to defectors. Claiming that Haryana was the minor peaceful state, he said though there were a few incidents after the Godhra incident, the people themselves brought the situation under control and compensated those who had suffered at the hands of fundamentalist elements. The rally attains significance as the Chief Minister, Mr Om Prakash Chautala would announce party candidates from 10 Lok Sabha seats in the state. The countdown has begin following the Election Commission’s notification of polling in Haryana on May 10. The INLD has five members in the dissolved Lok Sabha from the state while remaining five seats went to its then alliance partner, the BJP. However, after breaking off from the BJP, the INLD would now contest all parliamentary seats. Apart from announcing nominees from the parliamentary constituencies of Sonepat, Ambala, Faridabad, Mahendragarh and Karnal, the fate of certain outgoing MPs hangs in balance, as speculations are rife over the replacement of certain candidates. Mr O.P. Indora from Sirsa. The INLD supremo has announced the candidature of Ms Krishan Malik, wife of DGP M.S. Malik from Sonepat yesterday. The INLD is making efforts to make the rally a success. The rally ground has been given a facelift. District administration officials and party leaders have been camping at the Nehru College ground here to overlook the preparations. Mr Bhupinder Singh Hooda, Leader of the Opposition, said the paramilitary forces should look after security at Sonepat at the time of polling. “The state police should not be deployed in the constituency”, he demanded. Mr Rajeev Jain, General Secretary of the Haryana Vikas Party, said if Ms Malik decided to contest the Lok Sabha elections, her husband should resign from the post of DGP to ensure that the police did not play a partisan role during the poll. Mr Jain alleged that a large number of plainclothesmen had been sent to Jhajjar by the DGP to swell the crowd at the INLD rally there tomorrow. Mr Krishan Singh Sangwan (BJP) represented Sonepat in the dissolved Lok Sabha. Addressing a rally organised by the manch here last evening, Mr Tanwar announced that the party would contest the next parliament elections from three Lok Sabha seats in Haryana on its own. He said the party would field Mr Ramji Lal Suthar, president of the district unit of the manch, Mr Mange Ram and Mr Ranbir Singh Panchal from the Hisar, Bhiwani and Rohtak Lok Sabha seats respectively. He also announced that the party would contest all 90 assembly segments in the coming Assembly election in the state. He alleged that all political parties in Haryana were working against the interests of backward classes. Mr Keshav Pandit, president of the Rastriya Prajapati Sangh, also addressed the rally. The local unit of Congress, including the State Mahila Congress President, Ms Sumita Singh, has announced to block the rail traffic at the local railway station to show their resentment against the Union and the state governments for “betraying” the people of Karnal regarding the announcement of the establishment of a medical college in the memory of Kalpana Chawla. Ms Sumita Singh alleged that after announcing the setting up of a medical college at Karnal, the Union and the state government had backed out from the announcement. In a press statement issued here today, the union press secretary, Mr R.L. Goel, said a strong resentment prevailed among the teaching community over this decision. The Member Parliament, Mr Ajay Singh Chautala, and the Haryana Education Minister, Mr Bahadur Singh, had given a categorical assurance to the teachers that there would be no withdrawal or reduction in the grant-in-aid to the aided colleges. Mr Goyal said thousands of posts were lying vacant in the aided colleges due to ban on recruitment. This was affecting the quality of higher education. The meeting also deplored the apathetic attitude of the government over the non-payment of dearness allowance on pension. Teachers urged the Chief Minister to intervene so as to ensure quality education in the state and to ensure a dignified and honourable existence of the teachers. The union’s annual convention will be held on April 4. The police had registered a case against seven Youth Congress leaders, including Mr Chetan Chauhan, Mr Rajdeep Singh, Mr Ravinder, Mr Vijay Kumar and Mr Jitender. The next hearing in the case will take place on July 28. Meanwhile, leaders of the Ambala BJP have condemned the act of the Youth Congress activists. The president of the Ambala BJP unit, Mr Ravinder Dhawan, said the Congress had lost its base in the state and that is why it had been taking such steps. The president of the youth wing of the Ambala unit of the BJP, Mr Hari Kishan Aggarwal, said in a statement that the BJP youth wing would not allow Congress leaders to hold rallies in the state if the Youth Congress tried to disturb rallies of the BJP in future. Some of leaders of the Ambala Congress have condemned the police for resorting to lathicharge on the Youth Congress workers. The president of the District Congress, Ms Kiran Bala Jain, said in a statement that in democracy every citizen had the right to protest. Meanwhile, the Haryana Pradesh Youth Congress president, Mr Satwinder Singh, said here today that Youth Congress activists would gherao the BJP general secretary, Mr Pramod Mahajan, wherever he went in Haryana. He said they had taken a serious note of yesterday’s incident in which seven Youth Congress activists were injured and five were picked up by the police. “We have decided to gherao Mr Pramod Mahajan in all districts in the state. We will continue our agitation against him till he publicly apologises for the incident. We will not allow any of his programme to pass off smoothly,” he said. “Mr Pramod Mahajan has spoken against women in general and Ms Sonia Gandhi in particular. We will not tolerate it,” he said. He said they had requested the party high command to give two Lok Sabha seats to youth leaders in the state. “We have requested that Hisar and Kurukshetra seats should be given to youth leaders,” he said. The deputy spokesperson of the Haryana Pradesh Congress Committee, Dr Pradeep Chauhan, the Ambala Cantonment district unit president, Mr Ashok Jain, the Ambala City district unit president, Ms Kiran Bala Jain, and other Congress leaders condemned the remarks made by Mr Pramod Mahajan. The deceased, identified as Prem Pal, was found at about 2.15 am today. He had suffered serious head injuries and was also bleeding profusely from nose and ears. Sources in the jail revealed that Prem Pal, Jai Bhagwan and Pritam, all real brothers’, residents of Dayanagar, Taraori (district Karnal) were convicted in a murder case (FIR No. 445, 20.10.1999) and were lodged in the Karnal Jail. They had slept in the cook house (kitchen) of the jail last night. At about 2.10 am, Pritam woke up and found that his brother Prem Pal was bleeding. In a statement given to the jail authorities he said. When I returned after urinating, I heard someone gasping. I went to the spot and found that my brother Prem Pal was gasping in pain. I immediately woke up the Warden on duty in the cookhouse and reported the matter to him”. The duty officer, Mr Varinder Pal Singh, Assistant Superintendent of the jail, rushed to the spot and called up the medical officer, Dr Munish Kumar. The doctor suggested that the victim should be sent to the emergency ward of the local civil hospital immediately. However, Prem Pal was declared brought dead by the duty medical officers in the civil hospital. Mr R.S. Doon, District Magistrate, Karnal, told this reporter that a magisterial inquest has been ordered into the incident under Section 176 of the Cr PC. Mr Lajvir Singh, Additional deputy Commissioner, has been asked to hold an inquiry into the incident and report to the DM office within 15 days. Mr Doon said the ADC had also been asked to compile the inquiry report along with the post-mortem report, videography, chemical examiner’s report and histopathological report. The matter had also been brought to the notice of the National Human Rights Commission (NHRC) and the State Home Affairs Department by the DM office. Mr Yudhister Yadav, Superintendent of the Karnal Jail, however, refused to meet this reporter. Dr Munish Kumar, Medical Officer of the jail told TNS that Prem Pal was allegedly murdered with a large spoon (karcha). According to a recent study, “Differential impact of extension services of dairying in Punjab” conducted by Dr Ram Chand, head of the extension division of the National Dairy Research Institute (NDRI), Karnal and his associates Dr B.M. Mahajan, Mr Dalaur Singh and Mr D.K. Gosain it was found that “the constraints perceived by the dairy farmers and the dairy development officials at the grassroots level need to be plugged by policy makers to further dairy development in Punjab”. The study was conducted in eight districts of Bathinda, Ludhiana, Hoshiarpur, Moga, Muktsar, Ferozepore, Gurdaspur and Ropar covering 1920 farmers of varied economic status. Out of which, 960 farm women were also interviewed during the study. The dairy scientists measured the knowledge, attitude, aspirations and constraints of the farmers. The study has pointed out that the farmers lacked basic knowledge about scientific breeding, feeding, management and health cover. However, their aspirations to enhance the milk production were high but faced problem due to lack of better coordination with the authorities of the state Dairy Development Department. The study has suggested that there was a need to open more artificial insemination centres in the state, need to establish telephone help lines for dairy farmers and to promote education programmes for the transfer of latest technologies to the farmers. “The new technologies have been adopted by well-off farmers but poor and marginal farmers are still lagging far behind in improving the breed of their cattle and buffaloes to enhance the milk production”, said Dr Ram Chand. He said the efforts of dairy officials to educate and train these farmers matter a lot in the economic upliftment of farmers. Setting up of small dairy units could prove a better side-business for the farmers to improve their finances, he added. A scintillating musical evening for defence officials was held in Ambala Cantonment in association with The Tribune. The evening was organised at the Sirhind Club under the aegis of Headquarter Punjab Haryana & Himachal Pradesh (Independent) Sub Area. 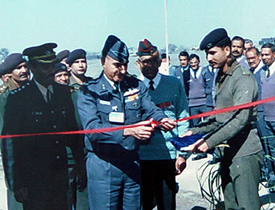 GOC 2 Corps Lt-General G.D. Singh was the chief guest. A number of senior Army officials were present on the occasion. The function was organised as a welfare measure for the defence officers and civilian members of the Sirhind Club. Noted Punjabi pop singer Mika enthralled the audience with Punjabi and Hindi songs. Mika sang foot-tapping numbers which went down well with the gathering. The singer seemed to have felt the pulse of the audience and sang popular songs. The evening began with the evergreen Bollywood song “Jab Koi Baat Bigad Jaye”. Keeping in mind the fact that it was a defence cultural show, Mika sang “Kitne Bhi Tu Kar Le Sitam” and remarked “this song is for Pakistan”. With Holi round the corner, Mika sang “Rang Barse Bheege Chunar Wali Rang Barse”. The Punjabi pop singer, better known for his nasal drawl, had to sing the songs “Gabru” and “Saawan Mein Lag Gayi Aag” a couple of times on popular demand. He sang songs which are based on well-known folk numbers. 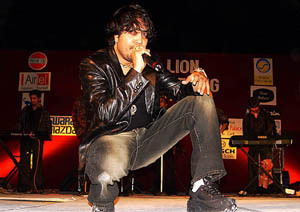 Some of the Punjabi songs which Mika sang include “Ishq Brandy”, “Billo Yaar Di Nishani Challa Mangdi”, “Din Nahin Langda, Raat Nahin Langdi” and “Sadde Naal Aaj Bhangra Pa Sohniye Ve”. Mika later invited children to dance along with him on stage. The unit provides postal logistics to Air Force stations, units and establishments through FPOs and SDOs located at 10 stations in Punjab, parts of Haryana and Uttar Pradesh. Air Cinde L.K. Malhotra, Air Officer Commanding, 7 Wing, Air Force Station, spoke about the importance of services rendered by APS postal unit OC Capt G. Srinivas Reddy and his staff. Later, AOC Malhotra inaugurated a philately exhibition in the postal unit complex. The frames were put up by Major R.N. Kaushal (retd). These depicted the concept and development of aeroplanes right from the Pushpak Viman of Ramayana era to the grounding of Concorde. In vintage postal history category, a more than 100-year-old postcard was shown. It was addressed to Pandit Nand Kumar, Madau Heri village, Tehsil and post office Kharar, Ambala district, and was posted from Jammu in June, 1896. The postcard was wrongly addressed by the sender, but despite 13 postmarks, the Lahore post office managed to forward it to the right addressee within seven days. 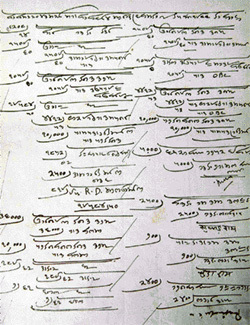 A bahi khata (traditional ledger) written in Langdi Hindi in Ambala. AMBALA: ‘Langdi Hindi’, a special language which was used for book-keeping in the olden days, is on the verge of extinction. The language was not only commonly used here till recent times, there was a school here which was dedicated to teaching `Langdi Hindi’ to the aspiring `munims’. Now, the ledger books are either maintained in Hindi or English. Dr Nem Chand Jain, senior vice-president of the Haryana Chamber of Commerce and Industry, said the school for teaching Langdi Hindi closed down a few decades back. “The language has gradually diminished and is hardly in practice,” he said. He said students at the special school located in Shahpur would undergo rigorous training to learn the language. “Although, Langdi Hindi was spoken in Hindi, it was written in a different form. All entries in the olden days used to be made in Langdi Hindi,” he said. Dr Jain said the `Bahi-Khata’ used to be maintained by a ‘munim’ who would systematically enter the day’s earning and expenditure. “It was simple yet effective method. There was no question of any error,” he said. He observed that even the taxation officials had to pick up the language so that they could follow the entries made in Langdi Hindi. “I remember that the officials had to be taught and they would approach us for deciphering the entries. Also, besides the ‘munim’, the officials would expect the shop owner to be able to understand the language so that in case of any problem, it could be sorted out,” he said. Mr Bisheshwar Nath Bansal, who can read as well as write in Langdi Hindi, said the Mahajani school used to teach Langdi Hindi. “The students would sit on mats. The training was rigorous. A wooden pen would be used to write on a wooden plank. We used to use black ink. It is also an excellent method for improving the handwriting,” he said. Mr Bansal said the language could also be considered to be a `shorthand’ of Hindi. “There only a handful of people in Ambala who can understand Langdi Hindi,” he said. He pointed out that besides the language, even the weight measurements for traders has changed. “For instance, measures like ‘chhatank’, ‘ser’ and ‘batta’ are in less use and for jewellers, there is ‘masha’ and ‘ratti’. Also, weights like 350 gram called ‘hoonta’ are no longer in practice,” he observed. Commission agent Sanjay Singhal said he picked up the language from his ‘munim’. “Although, we have switched over from Langdi Hindi, I learnt it by practising the language,” he said. “It is very difficult to get ‘munims’ who know Langdi Hindi so people are switching over to Hindi or English,” he stated. As many as 71 substations have been constructed while the capacity of 240 has been increased so far. This was stated by the Haryana Chief Minister, Mr Om Prakash Chautala, at Sikandarpur village, about 12 km from here, yesterday. He was addressing a gathering after inaugurating a newly constructed 132 KV substation in the village. With its commissioning, 2000 consumers of six villages will benefit. The Chief Minister announced that there would be no paucity of power by the end of this year as a number of power projects would be commissioned during this period. Later, the Chief Minister also inaugurated a 220 KV substation constructed at the cost of Rs 19.17 crore in Rania town. The substation will benefit consumers of 73 villages. The Governor suggested this the rest house building could be developed as a museum and a rest-house for the VIPs with adequate beautification, parking and landscaping. He said this ancient monument, known as the rest house of Raja Udey Singh of Kaithal, could be developed as a useful resort with the financial assistance from the Archaeological Survey of India. The resort could become a centre of attraction for the pilgrims who visit Pehowa on the occasion of the Chaitra Chaudas Mela. The police has registered an FIR under Section 302 of the IPC and initiated an inquiring into the incident. However, no one has been arrested sofar. The deceased has been identified as Ranbir (40), a resident of Sector 8, here. According to information, someone knocked at the door of his house late last night. As he opened the door, he was attacked by sharp-edged weapons. He was taken to the local Civil Hospital where he was declared brought dead. The post-mortem report of the body was awaited. The body was sent to the civil hospital here for post-mortem examination. The Railway police has registered the case. It was not known whether it was suicide or an accident. The body was yet to be identified. Two special trains are going to be run for the convenience of passengers during Holi. A railways official said a special train would run between Amritsar and Katihar. The train (485 Up and 486 Dn) would have 12 general coaches. The second train would run between Delhi and Jammu Tawi. The train would be 403 Up and 404 Dn.